I started to crochet a doll dress. It said to start with a lighter color. I have a light and dark pink but I forgot myself and started with the dark pink so now I'm at the point where I change to a darker color and I decided to use red. That's not the problem. The pattern says that the ch 3 at the start of the row counts as a dc so I had crocheted in the first stitch and by the end of the row I had 1 stitch left so I realized that they wanted me to skip the first stitch as the ch 3 counts as a dc; so I took it out and crocheted it over and continued on and got to where I divided the sleeves and did the next row and then it says to change to a darker color. Well, I did the first row of the darker color, skipping the first stitch and was one stitch short by the end of the row so I took it out and crocheted the row over crocheting in the first stitch of the row and it worked out or so I thought. I repeated the 10 times and I don't have any more stitches on the row so I don't have 4 sts left on the row. What do I do? I just counted the stitches and there are 87 sts on the row. So why doesn't it work for the rest of the 1st row when changing to the darker color? The pattern says to change to a darker color after row 8. Last edited by Jean Marie; 11-14-2018 at 05:41 PM. I was thinking that if I crochet 1 dc instead of 2 dc's at the beg of row 1 of the skirt and then I would have 1 stitch left at the end to crochet 1 dc so it would be even so it would be 1 dc at the beg and 1 dc at the end of the row. Last edited by Jean Marie; 11-16-2018 at 10:17 AM. I think I got it. On row 1 of the skirt if I skip that first st and dc in the next st cause the chain is counted as a dc and then do the v st and shell 10 times not repeat 10 times and then skip 3 and v st. Then I would have 3 sts left on row to do 3 dc's. I skipped the first st and did a dc in the next 2 sts and then did a v st in the next stitch, chained 1, skipped 3 and shell in next st. I did a total of 10 v sts and shells. Then I chained 1 and skipped 3 sts and did a v stitch in the next stitch and I had 3 sts left so I could put a dc in ea of the last 3 sts. At the end of row 5 it doesn't say to ch 1 after the 6 dc's. On the row below the end of row 5 is the beg of row 4 which has a ch 1. I looked ahead to row 6(the end of row 5 is going to be right below the beginning of row 6) and there is a chain 1 at the beginning of the row so I chained 1 at the end of row 5 after the 6 dc's. I finished row 5. Last edited by Jean Marie; 11-17-2018 at 04:01 PM. On rows 6-9 of the skirt in the () do they want me to put the dc in the ch 1 sp? Look at this picture from your link that you attached. The rows 6-9 you are working shells on the skirt you and 1 chain above the chain from a previous row to separate the shells. This is how I see the instructions. Hope this helps. Maybe you can help me on another question. At the end of row 5 it says to (dc, ch 1) in each of the next 6 dc's;On the beginning of row 6 it says ( 1 dc in next dc, ch 1 over ch 1 space) 5 times, 1 dc in next dc. After I (dc, ch 1) 5 times on the beg of row 6, I have a ch 1 in the previous row before the dc so do I ch 1 before the 6th dc on row 6? Last edited by Jean Marie; 11-18-2018 at 12:21 PM. 1 dc in each of the last 3 dc. Turn. You did not say if you did the last instructions in row 5 which was (1 dc in each of the last 3 dc, Turn). When you start row 6 you will have those 3 dc from row 5 to begin row 6. The way I read Row 6 is you are doing a sequence of stitches so at the end of 5 times your last stitch would have been a ch 1 over ch-1 space so your next stitch should be 1 dc in the next dc, ch2, shell-in -shell and so on ….. Rows 6-9: ch 3 (counts as 1 dc), 1 dc in each of the next 2 dc, ch 1, *( 1 dc in the next dc, ch 1 over ch-1-space) 5 times, 1 dc in the next dc, ch 2, shell-in-shell, ch 2 - repeat from * 10 times, (1 dc in the next dc, ch 1 over ch-1-space) 5 times, 1 dc in the next dc, ch 1, 1 dc in each of the last 3 dc. I hope I have answered your question if not let me know and we can try again. Yes I did the last 3 dc's on row 5. On row 5 where it says *(1 dc, ch 1) in each of the next 5 dc, 1 dc in the next dc - I didn't ch 1 after the 5th dc. I guess maybe I was supposed to ch 1 after the 5th dc on row 5? At the end of row 5 where it says (1 dc, ch 1) in each of the next 6 dc's I chained 1 after the 6th dc. Maybe I should do row 5 over? All the rows of the skirt say to repeat from * 10 times. There isn't enough sts to do that. Last edited by Jean Marie; 11-18-2018 at 05:40 PM. Hi Jean Marie, I don't know why but on these post some of them show how many pages there are and mine is set up to give me the most current page. Lately I don't see any page numbers on these posts and there are many attached to the one I tried to help you with so I am not sure which one you need help on. It is not your fault but I don't know if my last post helped you are not. I read some of the post from you where you skipped a stitch when the pattern does not say to skip a stitch (the first chain 3 is the first stitch then you are to do dc in the next 2 sts). Also when you say row 5 there are several row 5's the yoke, skirt and the ruffle. I answered row 5 of the skirt so I hope I answered your question correctly. When you read through the pattern before you started it did anything pop out to let you know that maybe the number of stitches were off and that could be your problem. Patterns have mistakes sometimes and it is so frustrating to get so far into a pattern to only find out it is wrong and you have to pull out several rows or start over. That has happened to me several times. Let me know if you need any help from me or if you figured it out. 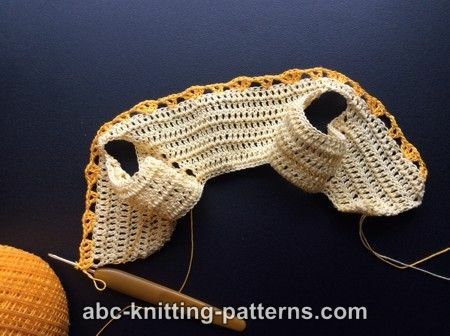 You know you are the best at figuring out stitches and patterns so I know you will get it right. Last edited by spoula; 11-19-2018 at 05:15 AM. In row 5 on the skirt it says 5 dc's. In row 6 on the skirt it says 5 times. Row 5 also says 1 dc, ch 1 in ea of the next 6 dc's. My question was after the 5 dc's in rows 5 and 6 of the skirt and the 6 dc's in row 5 in the skirt do I ch 1, but looking at the pattern and your previous answer I need to do row 5 of the skirt over and ch 1 after the 5 dc's on row 5 of the skirt and after the 6th dc on on row 5 of the skirt. So another words it's dc, ch 1, (that's once) dc, ch 1, (that's twice) dc, ch 1 (that's 3 times) dc, ch 1 (that's 4 times) dc (the 5th dc), ch 1 (that's 5 times) so I need to ch 1 after the 5th dc on rows 5 & 6 of the skirt and then again I need to ch 1 after the 6th dc on row 5 of the skirt.